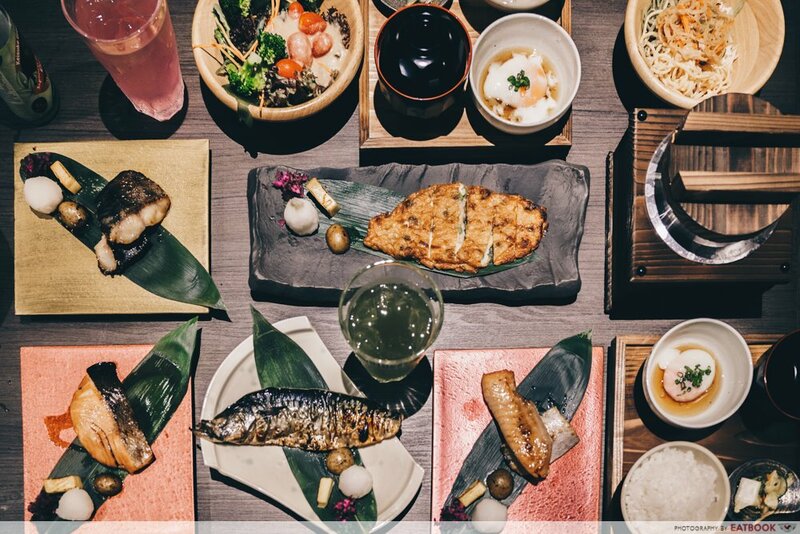 Just like how water is wet, Keisuke Takeda never fails to surprise with a new dining concept yet again. 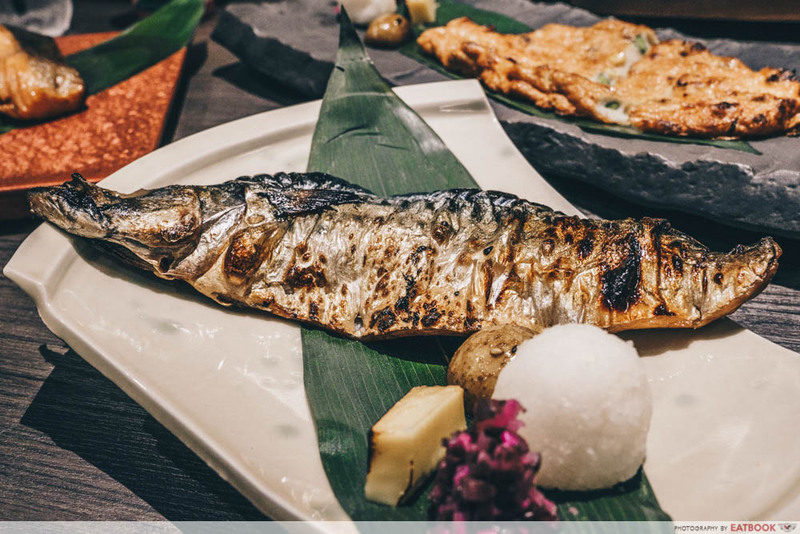 After crafting up eggy omurice and pasta with Omurice Keisuke, the Hiroshima native is back with something fishy at Charcoal-Grill & Salad Bar Keisuke. It’s all about sumiyaki, Japanese charcoal-grill, with meat items slow-grilled over steaming smoulders of charcoal. 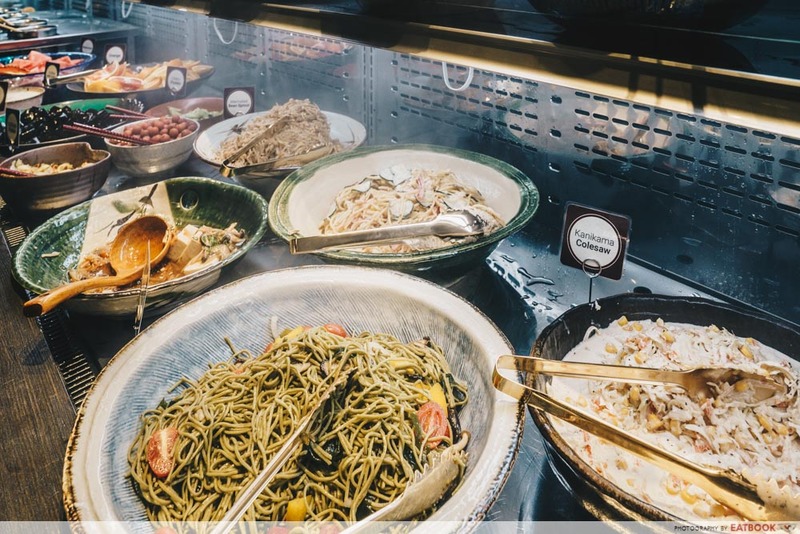 On top of that, visitors will also love the all-you-can-eat salad bar, which features more than 30 types of side dishes and fresh vegetables – reminiscent of Hamburg Keisuke. 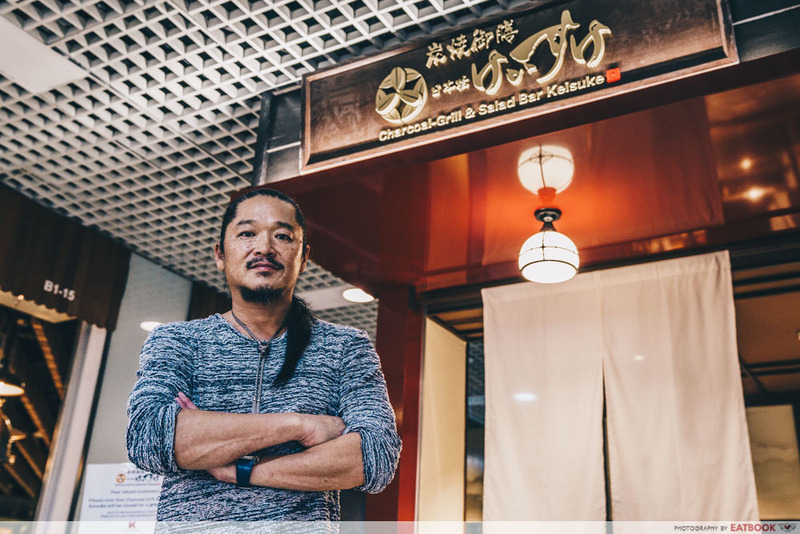 Wanting to introduce an authentic and traditional form of Japanese cuisine, Keisuke Takeda has pulled out all the stops here. 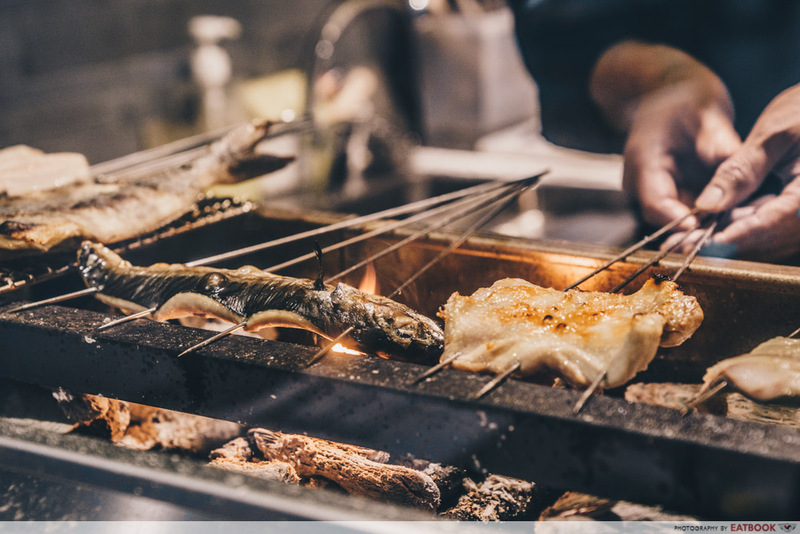 This includes sourcing most of their fish from Japan and using binchotan, Japanese charcoal, which emits a steady amount of high heat that make everything nice and juicy inside. Although the restaurant officially opens on 1 April 2019, we managed to sneak in and get an exclusive peek at a media event. Here’s what we thought. 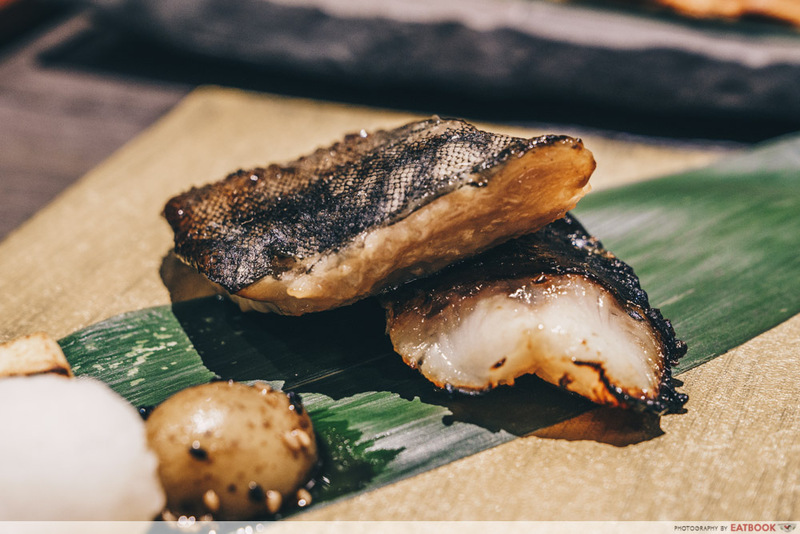 The menu is considered wide by Keisuke’s standards, with yellowtail, black cod, mackerel, and salmon to choose from. Each fish has a unique method of preparation, with a total of 12 items available. 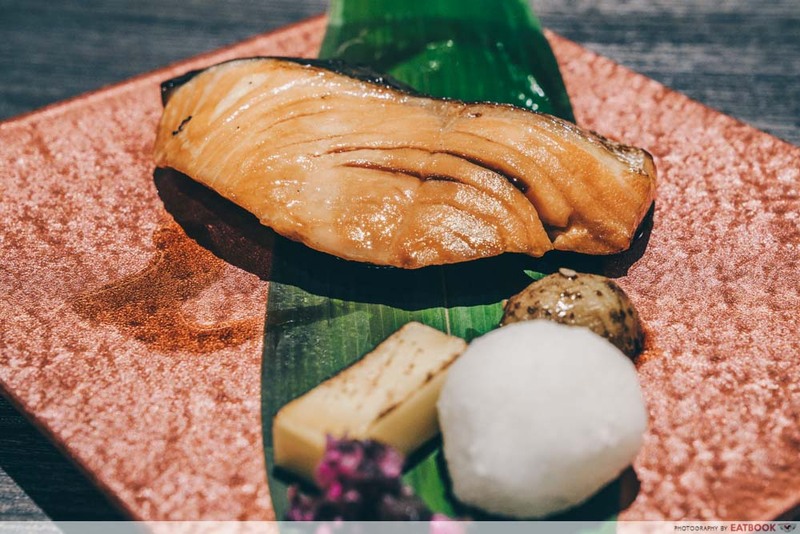 While salmon is not the first choice that comes to mind for sumiyaki, it remains a popular choice outside Japan for its creamy and mild taste. Charcoal Grilled Teriyaki Salmon Set ($15.90++) is slathered with a generous layer of teriyaki sauce that was neither too sweet nor salty. Acting as a supporting character, the sauce did well in bringing out the salmon’s rich and fatty flavours. The Charcoal Grilled Salmon Belly Set ($16.90++) will be a hit for those who love fatty meats such as pork belly, foie gras, or a juicy piece of ribeye. Storing most of their fat in the stomach, salmon belly is highly respected as the fish’s most flavourful component. Just like butter, the flesh melted in our mouths while giving off a luxurious creamy texture. I also appreciated how the fish was cooked just right, with a nice pinkish hue inside. I could eat a tray full of this. There’s no need to feel guilty about tucking into the fatty cuts of fish though – their fats are full of omega-3 acids which are actually good for you and your heart. I didn’t quite enjoy the Charcoal Grilled Miso Marinated Black Cod ($21.90++). 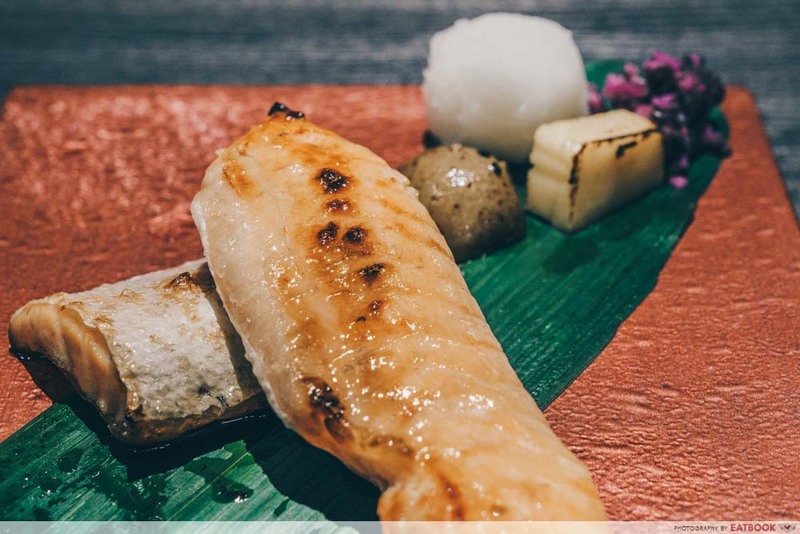 Similar to how it’s done at Nobu, the fish is delicately marinated to let everything soak through. However, I found the marinade to be too strong, overpowering the delicate fish. Perhaps less miso paste can be added to bring out more of the fish’s rich, buttery flavours. The Charcoal Grilled Mackerel Set ($11.90++) fared much better, with a ridiculously crispy skin and succulent flesh that had us hooked from the first bite. You won’t find the overly fishy flavours of poorly prepared mackerel here. Instead, the fish had a beautiful mildly oily flavour and addictively firm texture to it. Each set also comes with miso soup, onsen egg, and a serving of Japanese rice. 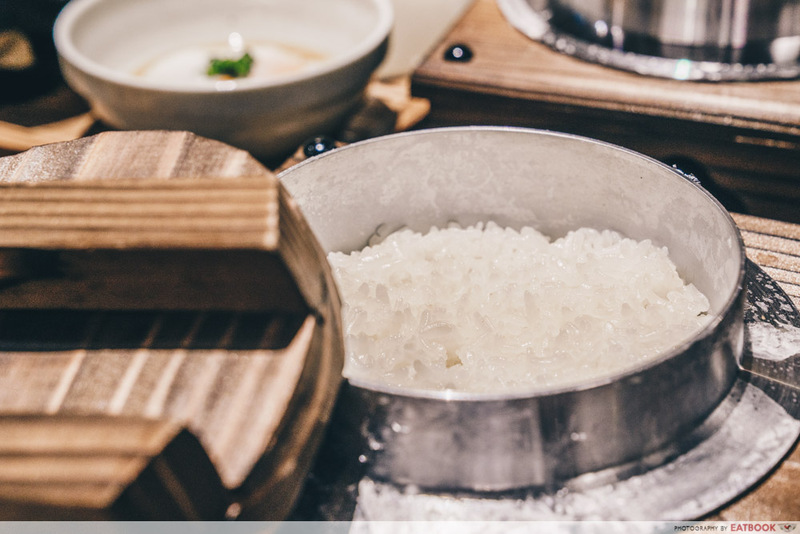 The rice is cooked and served in a special small iron pot that helps retain heat and locks in the fluffiness. The fish are only prepared upon order, so they might take some time to get ready. The free-flow salad bar ought to cure any hunger pangs with the wide range of dishes. It’s split into two sections: salad and cooked cold dishes. Filled with a variety of leafy greens and colourful vegetables, you can really put your creative juices to the test and make your own salad. The cooked dish section also has a stellar selection of cold items. 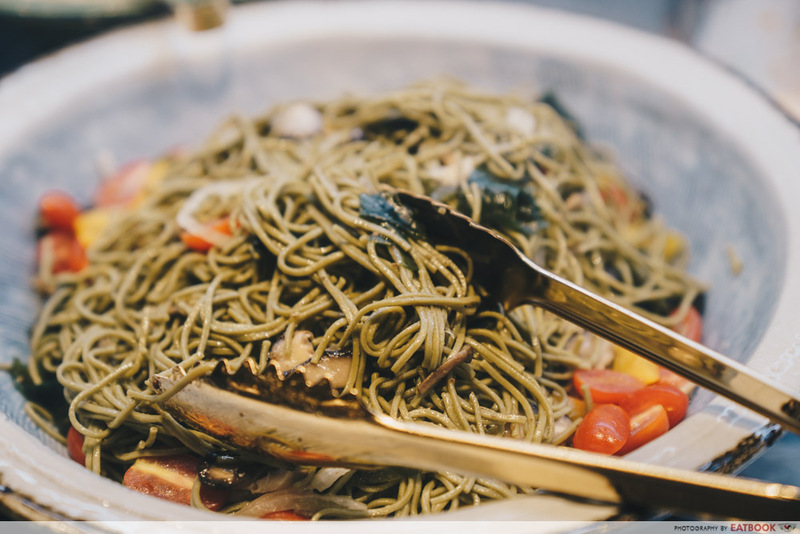 Potato salad, soba noodles, and pickled vegetables are a few of the popular items. 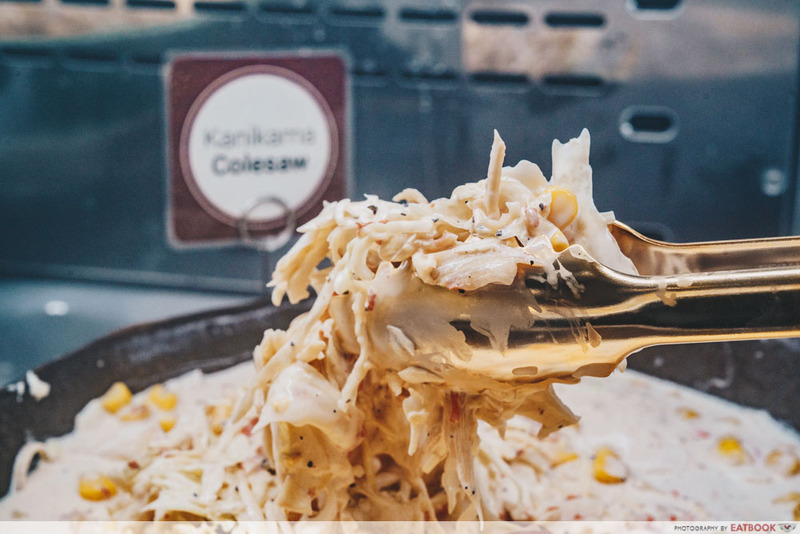 Our favourite was the kanikama coleslaw, which was drenched in a creamy mayonnaise dressing, along with fleshy shreds of crab sticks. Those who visit the salad bar at Hamburg Keisuke ought to be familiar with their coffee jelly. 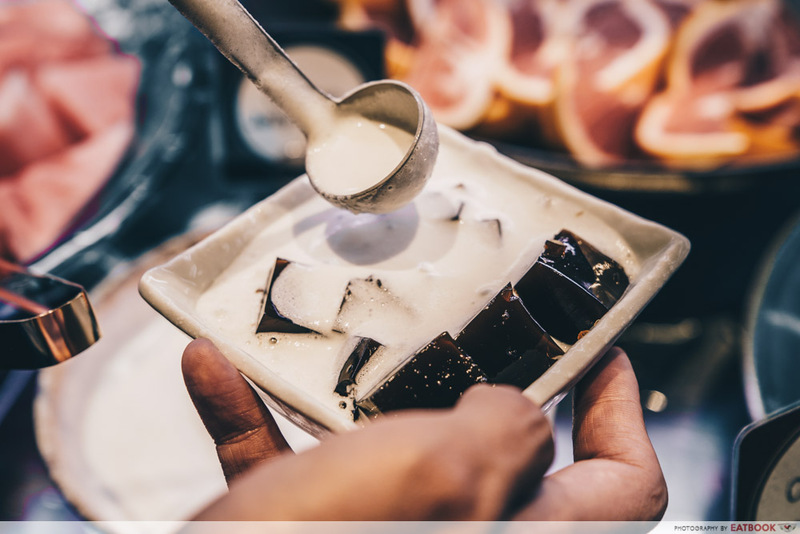 The crowd-favourite makes a return again with its beautiful combination of bitter coffee jelly and sweetened cream. I’m no coffee person, but found myself strangely drawn towards this addictively tasty dessert. Similar to the other Keisuke outlets, this restaurant is rather cosy with 33 seats. 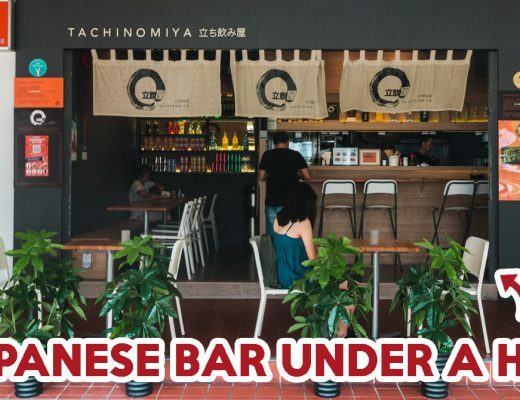 Despite that, there are bar, table, and even booth seats crammed inside. Service is fast and efficient, and the staff were quick to offer recommendations for those who might be confused with their rather extensive menu. 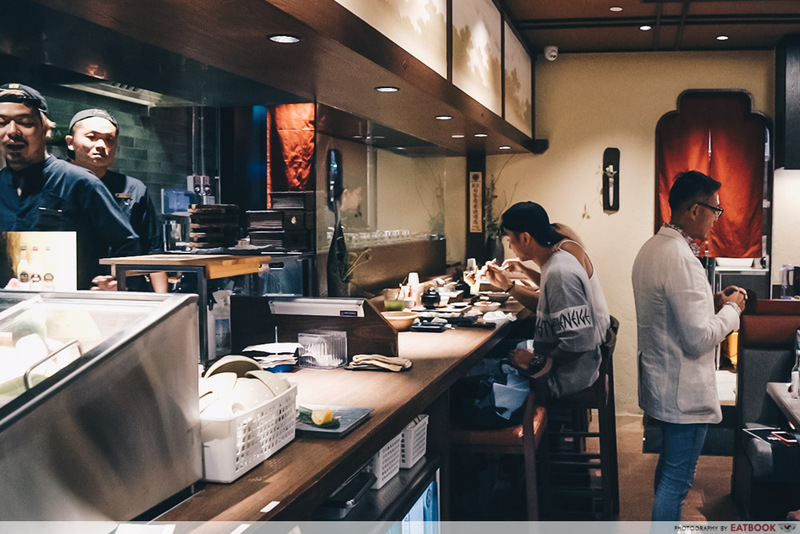 Just like any new Keisuke restaurant, come early or be prepared to wait in line when this restaurant opens on 1 April 2019. While there undoubtedly have been some hits and misses in some of Keisuke’s 19 different outlets, it’s safe to say that this one has smashed it out of the park. 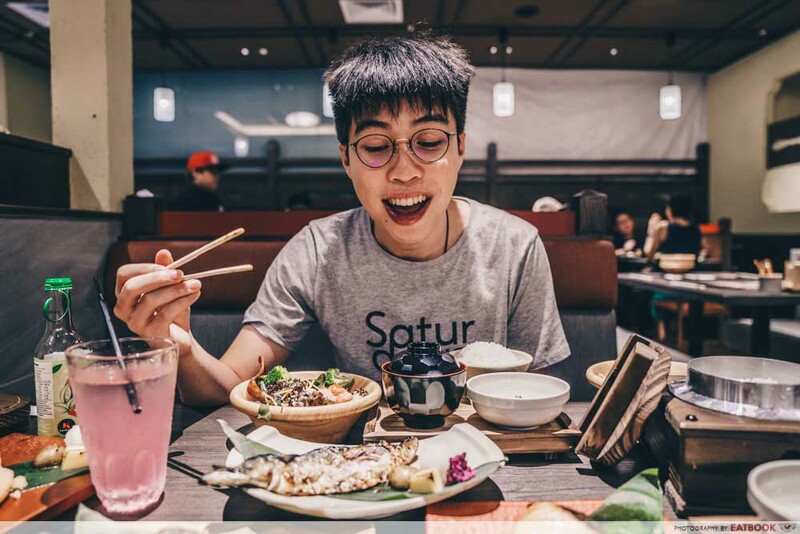 Offering fantastic value and tasty fare, we expect this store to be a real crowd puller in the East. 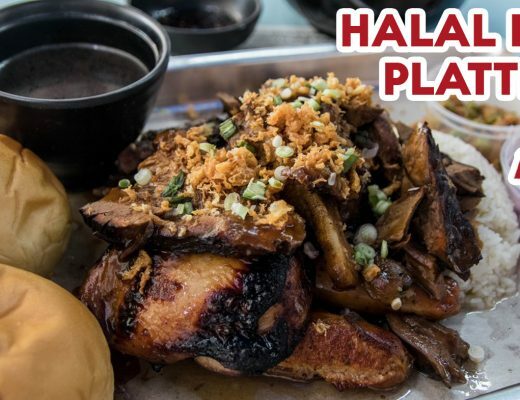 If you’re around the area and are put off by the long queues here, be sure to check out Don Lechon for their crispy suckling pig at $10 and Egg Stop for Korean street toast. Photos taken by Heng Wei Shin. This was a media tasting at Charcoal-Grill & Salad Bar Keisuke.